IZW experts Professor Thomas Hildebrandt and Dr Robert Hermes extract eggs from Iman, assisted here by BORA staff Hassan Sani. The 4 July 2018 announcement by Professor Thomas Hildebrandt of Leibniz Institute for Zoo and Wildlife Research and his co-workers that embryos of white rhinos have been successfully made in vitro represents one of the most exciting breakthroughs in years for rhino conservation. We at BORA, the Borneo Rhino Alliance, are ecstatic at this development, as it represents a new dawn for not just white rhinos, but also for another, even more endangered species – the Sumatran rhino. While there are only two females of the northern white rhino subspecies left, the white rhino species stands at close to 20,000 individuals. But there are fewer than 100 Sumatran rhinos left in the world. Even this may be an optimistic estimate with some reports claiming only 30 are left in the wild. As a result, for many decades, there have not been enough Sumatran rhino births to sustain the species, whether or not poaching can be prevented. Natural breeding was seen as the solitary key solution but in the past five years, there has only been one birth in captivity, while there have been three deaths. 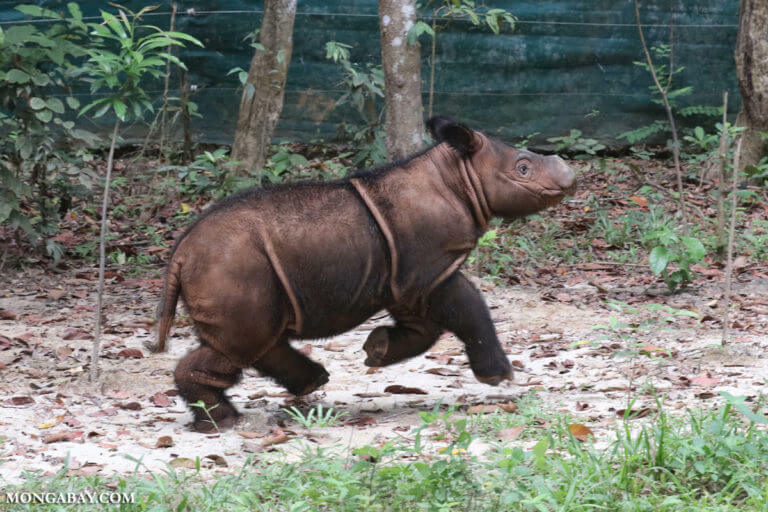 In the absence of concerted efforts to maximize all available avenues of increasing the number of Sumatran rhino births, the oldest and smallest of all rhino species has been on a one-way fast track to extinction. There is only one clear way now to save the species – all the last remaining Sumatran rhinos have to be brought into a single managed breeding programme, where two complementary approaches are taken: allowing the fertile ones to breed naturally, and supporting the infertile ones to allow their limited eggs and sperm to create embryos in vitro. 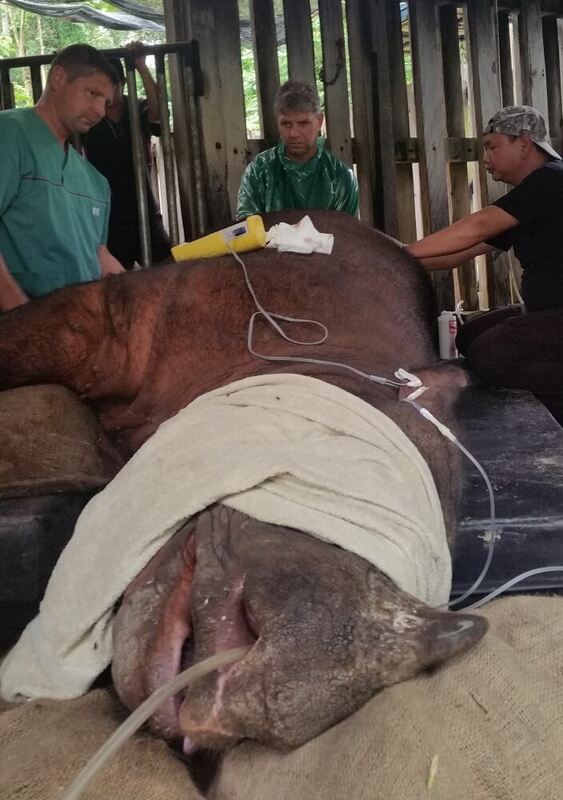 BORA has been desperately working for the past decade to try to breed new generations of Sumatran rhinos. 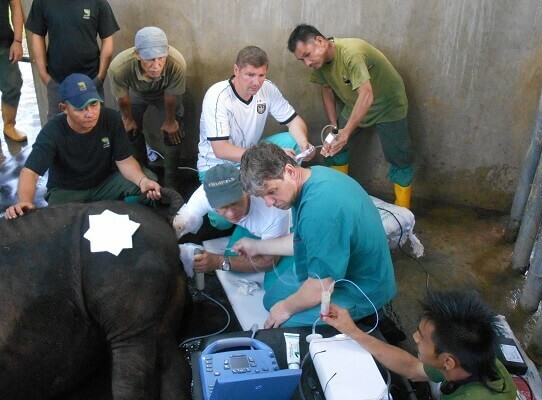 But we faced incredible obstacles in the form of not enough rhinos left in Malaysia and the rhinos’ reproductive tract pathology and infertility. With the help of Professor Hildebrandt (IZW, Germany), Professor Cesare Galli (AVANTEA, Italy) and Professor Arief Boediono (IPB, Indonesia) and their colleagues, we have tried to create a Sumatran rhino embryo in vitro. It was a process that had been derided by many of our counterparts as being fantasy and foolish thinking. But now with this success for the white rhino, the issue for the Sumatran rhino is no longer about “can in vitro fertilization be done?” but “why are we not prioritizing such work for Sumatran rhinos?”. Only a few tens of Sumatran rhinos remain alive in Indonesia, and only two, a female and a male in Malaysia. 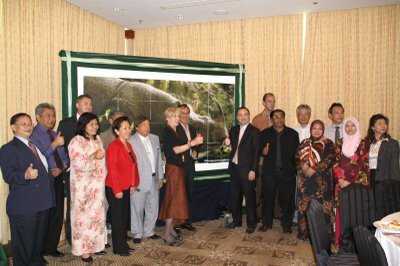 Professor Hildebrandt and his co-workers have been aiming for in vitro production of Sumatran rhino embryos since 2011, when there were three females and the male alive in well-managed facilities in the Malaysian State of Sabah and five managed in the Sumatran Rhino Sanctuary in Indonesia. 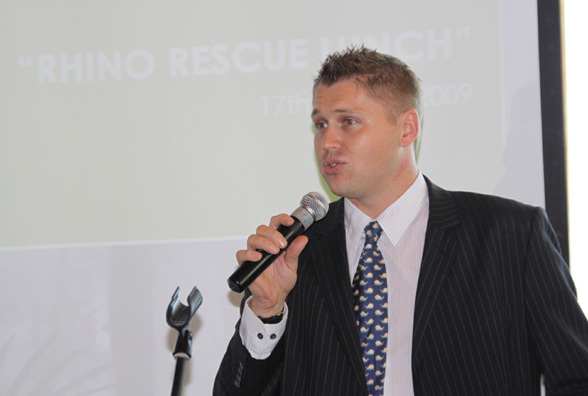 But the advanced reproductive technology group has never managed to gain interest from some of the most prominent institutions that need to collaborate or provide support to generate a single recovery programme. 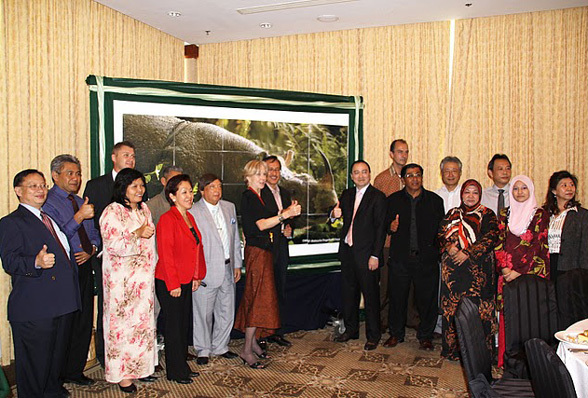 The government of Malaysia, Sime Darby Foundation, and numerous interested individual donors from around the world have provided critical financial support for attempts to apply advanced reproductive technology to Sumatran rhinos, but the shocking lack of interest outside Malaysia has stymied the much-needed species recovery programme. The amount of funding going to advanced reproductive technology on Sumatran rhinos simply has been not sufficient enough to allow the scientific process to catch up to the sort of work done on the northern white rhino. The funds from international donors, which currently include a generous donation from government of USA, have gone to camera trapping, surveys, anti-poaching patrols and meetings in Indonesia and USA. This approach fails to recognize that the greatest threat doesn’t come from outside the Sumatran rhino population. It comes from within. Too few Sumatran rhinos, that are scattered and not breeding. All these efforts are akin to putting a band aid over a tumor. For years, we’ve been trying to engage and work with prominent institutions that are able to influence or lead the charge to save the Sumatran rhino but we’ve been forced to refrain from taking them to task. But today, we make our stand. The science of advanced reproductive technology is now beginning to deliver, and all of us must embrace it as we do everything in our power to save the most endangered of rhino species by increasing the number of births. We call on the Government of Indonesia, the International Rhino Foundation and the International Union for Conservation of Nature, to recognize the incredible and critical opportunity we have in front of us. 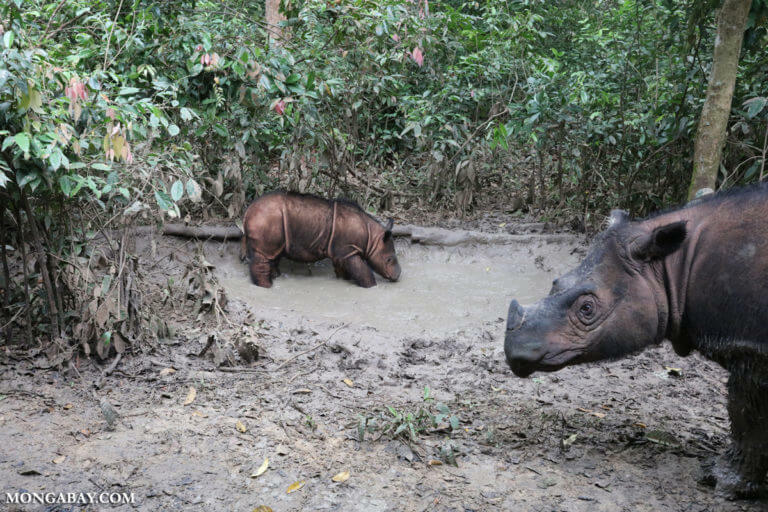 Create a programme that prioritises Sumatran rhino births, through both natural breeding of fertile rhinos and in vitro fertilization for those that need such help. The alternative is to choose certain extinction. One of three left: Filepic of Tam, the only remaining male Sumatran rhino in Malaysia, in his enclosure at the Tabin Wildlife Reserve. 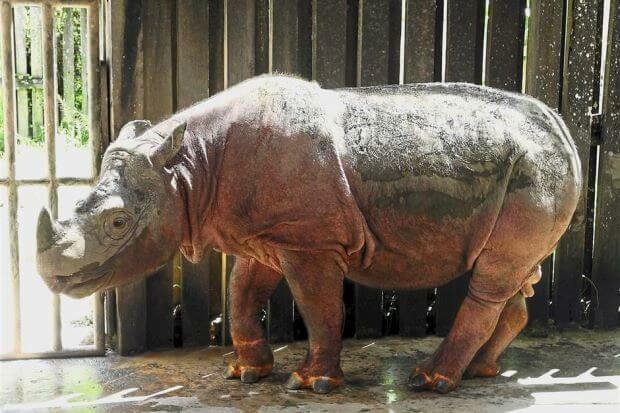 KOTA KINABALU: Scientists are keeping the skin cells of Sabah’s three remaining Sumatran rhinos in the hope of using future tech­nology to breed the threatened species. 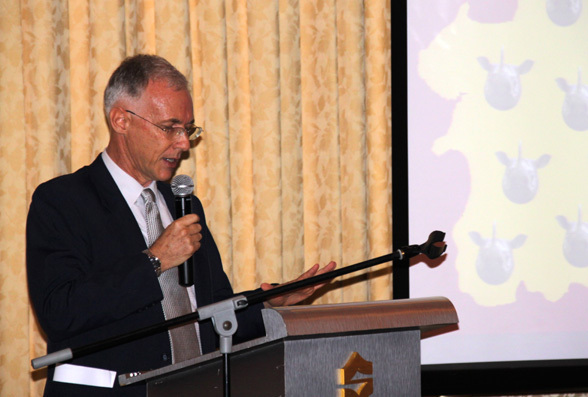 Borneo Rhino Alliance (Bora) executive director Datuk John Payne said Sumatran rhinos in Sabah are considered extinct in the wild and with only three left in captivity, Sabah alone is not able to save them. He added that advanced techno­logy would be able to use the skin cells and turn them into eggs or sperms, before they are transformed into induced pluripotent stem cells for the creation of an entire animal eventually. “Prevention of extinction can only happen if all authorities with Sumatran rhinos under their jurisdiction are willing to collaborate on a programme to boost birth rate. 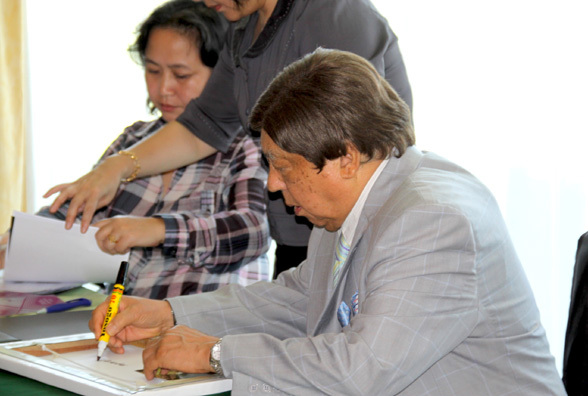 “That means Malaysia – which is ready at Sabah and national levels – along with Indonesia at central level plus Aceh and East Kalimantan provinces must work together,” he said. 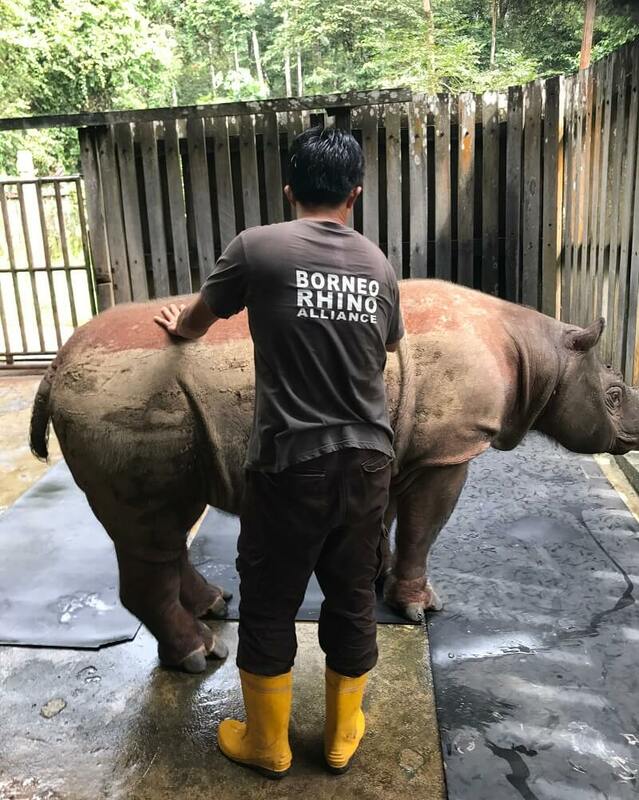 All three rhinos in captivity – a male called Tam and two female, Puntung and Iman – are being cared for by Bora at the Tabin Wildlife Reserve in the east coast of Lahad Datu district. Wildlife experts’ attempts to get Puntung and Iman to mate with Tam were unsuccessful as the female rhinos have cysts lining their uteruses. The cysts are resistant to treatment. Puntung is also suffering from a life-threatening infection. 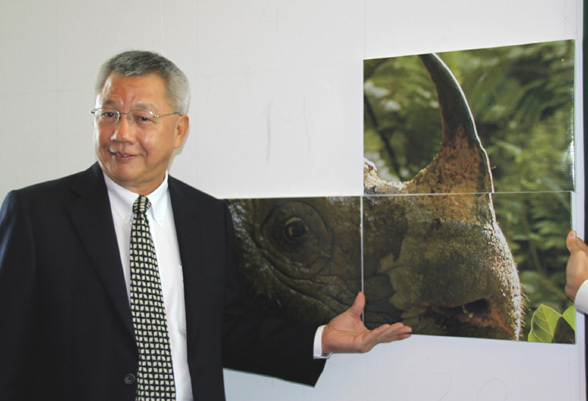 Payne suggested surrogacy involving Indonesian rhinos, or other rhino species if Indonesia is not interested. 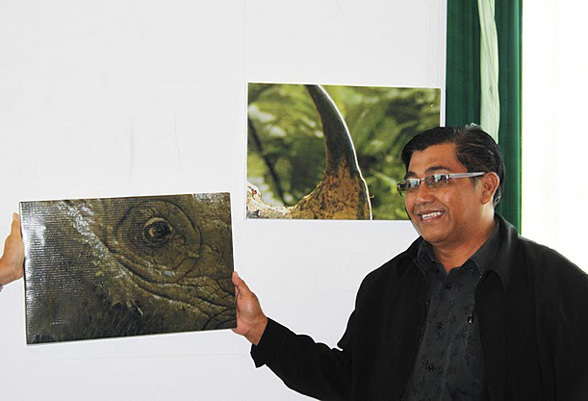 He said the number of wild rhinos, except maybe in Aceh mountains, were too few to be viable if left in the forests. “That fact should be obvious but has been ignored over the past 40 years,” he said. The skin cells of the Sabah Sumatran rhinos are currently cultured in laboratories. 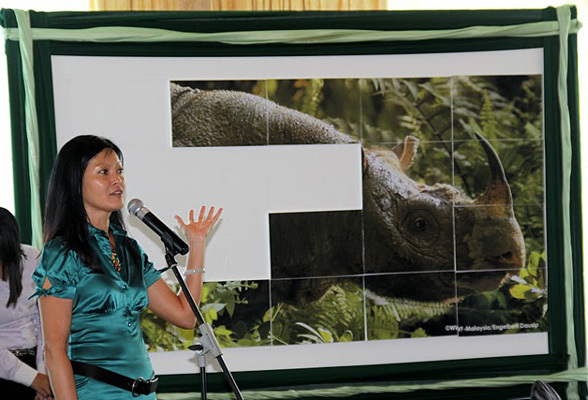 1 Mar 2015, Kota Kinabalu: The Sumatran rhino once browsed the forests in India, Bangladesh, Myanmar, Laos, Thailand, Malaysia, Indonesia, and China. By the mid-20th century, its range and population has drastically shrunk due to forest habitat loss and killing for its horn. The demand for rhino horn stems from the common yet misguided belief that it harbours medicinal properties. In Malaysia, a disturbing combination of factors has led to its dwindling population and near-extinction: the lack of knowledge on rhino population and reproduction status in the wild, poor husbandry practices in captive centres, the conservation focus being solely on protecting rhinos in the wild which has not been effective, and at the same time not developing an effective captive breeding population as a parallel effort. Some wildlife researchers estimate that there are less than 100 Sumatran rhinos left in the world and current populations are largely confined to Indonesia, with very few wild rhinos possibly remaining in Sabah. In Peninsular Malaysia, the species is likely to be totally extinct although this terrible event has gone unrecognized. Rhino biologists regard the species as functionally extinct in all of Borneo as the few individuals remaining are insufficient to provide hope of survival of the species. 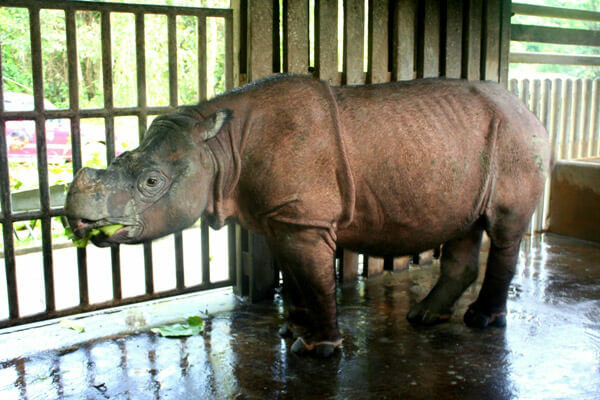 Over the last thirty years, more Sumatran rhinos have died than have been born, both in the wild and in captivity. Between 1984 and 1995, a total of 22 Sumatran rhinos were captured in Peninsular Malaysia and Sabah for a captive breeding project. Except for one which was already pregnant when captured, none bred while in captivity, and all have since died. It is clear that protecting wild populations has failed, and that natural breeding in captivity results in too few births to be a viable strategy. What remain of the Malaysian population are a male named Tam and two females named Puntung and Iman. Captured from the wild in Sabah from 2008 to 2014, the trio currently resides in the Borneo Rhino Sanctuary (BRS) in Tabin Wildlife Reserve, under the care of Borneo Rhino Alliance (BORA), a non-governmental organization developed for this purpose under the guidance 0f Sabah Wildlife Department. Unfortunately, both Puntung and Iman have severe reproductive tract pathology, possibly due to having gone un-bred in the wild for a long time. However both are still producing oocytes, which are cells that form eggs which then can be fertilized by sperm. Rather than throwing in the towel and abandoning the species to extinction, Sabah Wildlife Department and BORA with its donor Sime Darby Foundation are collaborating with Leibniz Institute for Zoo and Wildlife Research (IZW) in Germany and professor Cesare Galli and his wife of Avantea laboratories in Italy to produce Sumatran rhino embryos in the laboratory using Advanced Reproductive Techniques (ART). 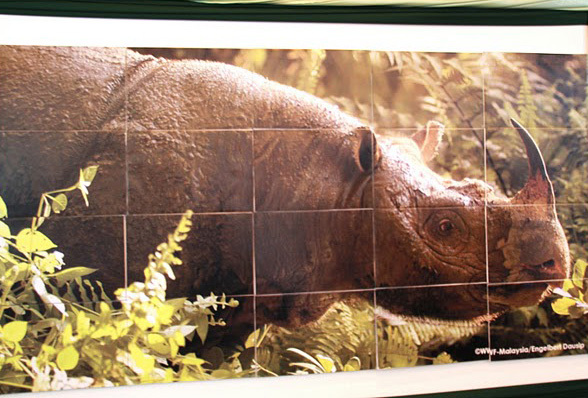 It appears that ART represents the best chance of growing the captive population of Sumatran rhinos. Compared to classical artificial insemination technique which pumps millions of sperm into the uterus of a rhino, a technique already well-established for domestic animals called intracellular sperm injection maximizes the chance of fertilization of the egg by injecting only one viable sperm into a single oocyte in a laboratory condition. The resulting embryo is then implanted into a female rhino for development of the foetus over a normal pregnancy period. According to Datuk Dr Junaidi Payne, BORA’s Executive Director, “All remaining Sumatran rhinos should be brought together in two or three closely-managed captive care facilities, where the use of their gametes can be maximised. At BRS, we are racing against time to harvest gametes from the rhinos here for use in in-vitro fertilisation, as well as preserving frozen gametes and stem cell lines within the 2014-2017 window”. 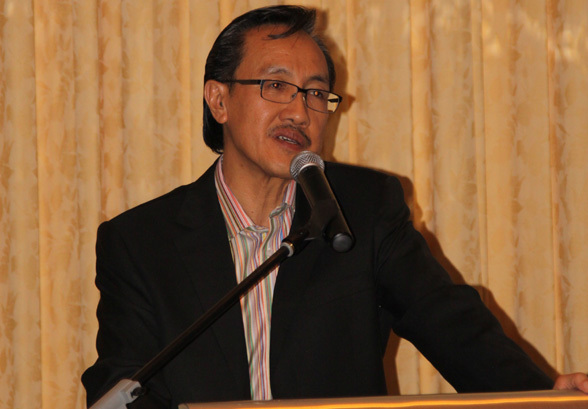 He added, “The programme which we are pursuing for this period requires a few millions of ringgit to run, with Sime Darby Foundation being the primary financial supporter, while the specialist veterinary team from IZW with associated colleagues from Avantea laboratories, Stanley Manne Children’s Research Institute and San Diego Frozen Zoo are providing Sabah with the necessary ART expertise,” he added. 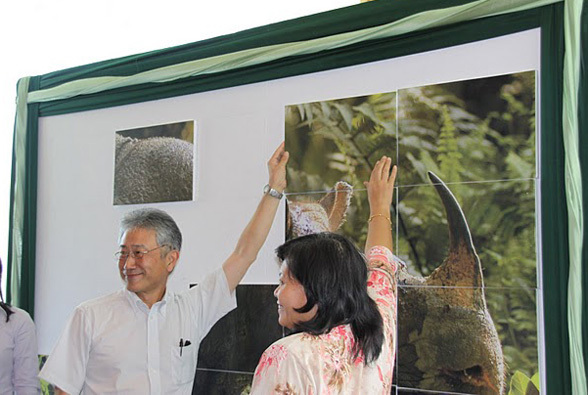 “Through ART, each rhino can be maximised to help save its species,” said William Baya, Director of Sabah Wildlife Department. He continued, “With the species on the brink of extinction, SWD is committed to support a global Sumatran rhino captive breeding programme using ART as it is the best chance we have to save this species. We are ready in principle to support Indonesia if requested”. 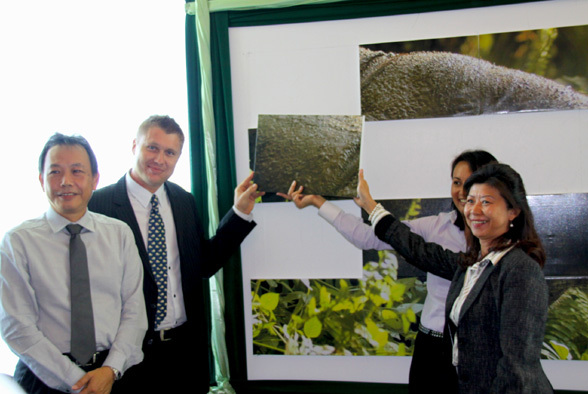 “WWF-Malaysia believes in using innovative solutions to resurrect the critically endangered Sumatran rhino population. 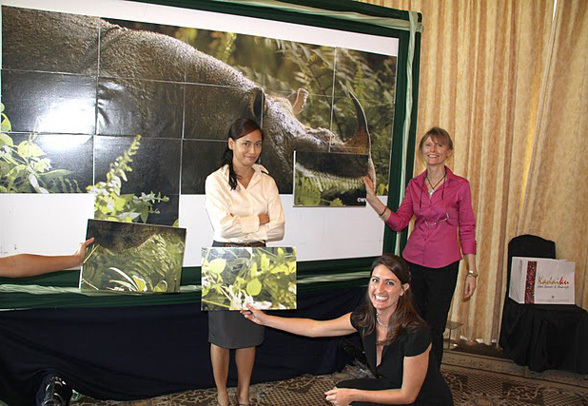 More than a century ago, moving critically endangered African rhinos on to fenced private land, as well as captive breeding of the European bison were necessary and successful elements in saving these species from extinction and we hope to have the same success for the Sumatran rhino with ART,” he commented. With time clearly running out, it is paramount that remaining wild rhinos are captured for ART as maximising births in captivity seems to now be the only viable way to save this 20 million-year-old mammal species from extinction. 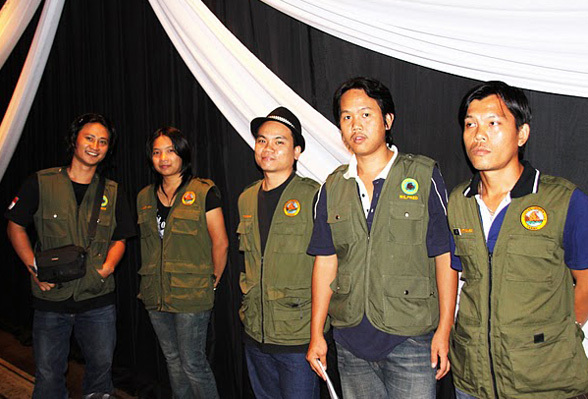 Read the original article on WWF Malaysia’s website. 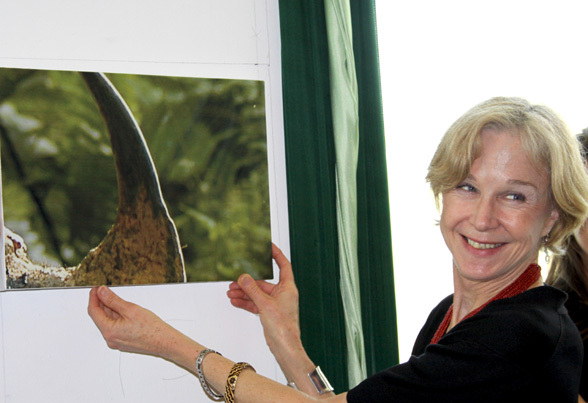 March 17 2009 saw LEAP helping to organise another groundbreaking conservation fundraising event with its partner organisation, BORA. 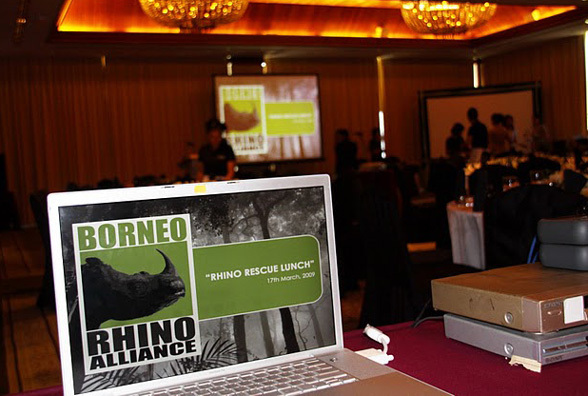 A ‘RHINO RESCUE LUNCH’ was held at a leading hotel in Kota Kinabalu. The Guest of Honour was the Sabah Minister of Tourism, Culture and Environment, Datuk Masidi Manjun and over 70 people participated, with representatives from the government, NGO and private sectors, as well as concerned individuals. 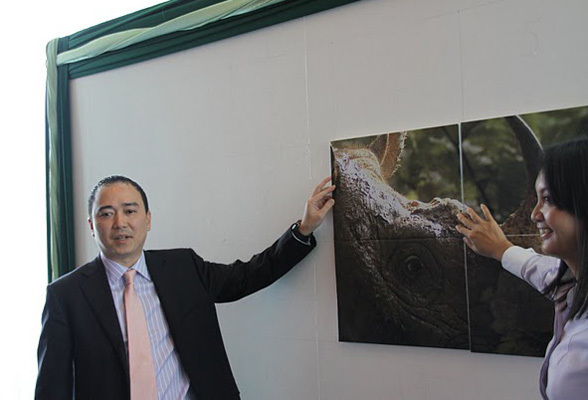 An amazing RM530,000 (about USD$150,000) was raised through a novel and interactive pledge-making process where pieces of a giant jigsaw of a rhino picture were ‘bought’ by donors. 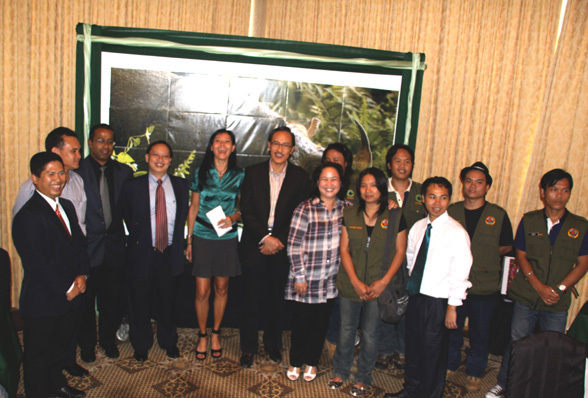 The event helped to bring the plight of the Bornean rhino to a much wider audience and resulted in operational funds being secured for the BORA Rhino Protection Unit to function for another year. 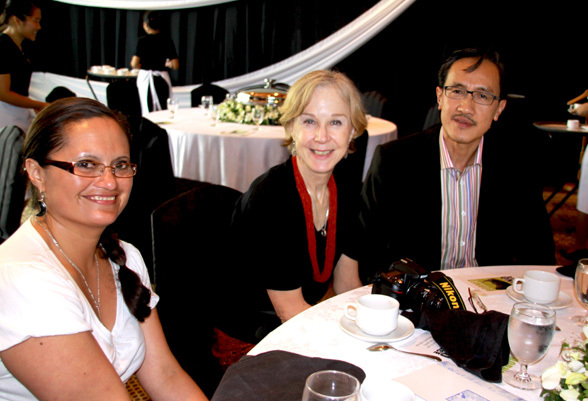 Click on a photo to view some of the highlights of the Lunch.